Both the political class in Harrisburg and the progressive community around the state are focused today on the redistricting issue. Last week the Senate State Government Committee passed a version of SB22 that was crafted by Senator Mike Folmer. Some of the advocacy groups that have been working in favor of a fair redistricting process have been cautiously, or in some cases not so cautiously, supportive of it. Some who have argued that the proposal itself is problematic have held that passing it in the Senate is a necessary step to reaching a better bill. 1. The commission created by the Folmer plan is not independent at all. It may look a little more independent than the current process, but it contains none of the barriers that limit political control over redistricting found, for example, in the California plan. 2. The Folmer proposal gives the General Assembly far too much control over the redistricting process, weakening the checks and balances on its power conferred under the current procedures for drawing congressional and state legislative district lines. At best, this is likely to lead to congressional and state legislative redistricting plans that go too far in protecting incumbents. 3. The Folmer plan might lead to an even worse result as it will often give the majority party in the General Assembly the ability to draw partisan district lines that benefit itself. Think through how the Folmer plan might work in practice and you discover at least two ways in which a General Assembly can put forward and enact a partisan gerrymander of both congressional and state legislative districts. 4. The Folmer proposal has no finality. It creates a process that might not lead to new districts at all. 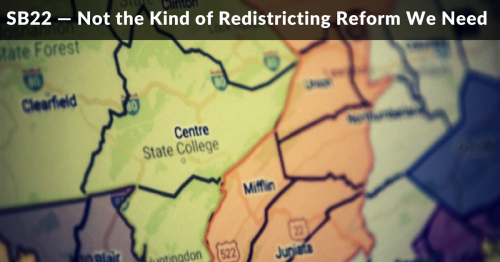 And there are other problems as well, including no guarantees in the Constitutional amendment that the redistricting commission will be representative of Pennsylvania in terms of geography, race, and gender. Some tentative supporters of the Folmer plan praise it for requiring transparency in the process of redistricting by insisting on open meetings and a prohibition against communication with members of the redistricting commission outside those meetings. But as we see time and again at every level of government, open meeting requirements are easy for political officials to evade. Other tentative supporters of the Folmer plan are saying that it is at least a step forward in that, should the Senate pass it, it is possible that the House will enact a better bill, and that a conference committee will come up with a final product that is acceptable. In response, let me first point out that even if the House were likely to come up with a better plan, there is no need to pass a terrible plan in the Senate to reach a better plan. The House could pass a better bill and the Senate could pass it or modify it before passing it. Senate passage of SB22 is neither necessary nor sufficient for the General Assembly to pass a good redistricting amendment. Second, it is very hard to understand why anyone has any faith that the House, which has been far more extreme and partisan than the Senate in the last few years, is likely to give us a better redistricting plan. The House is more likely to make it worse. And what those of us who want fair districts should really fear is that the House will take the Senate’s terrible plan and pass it, putting us one step closer to a constitutional amendment that, once enacted, will be very hard to undo. Finally, some tentative supporters of the Folmer plan are saying that, at the very least, moving it forward is a victory as it is better than the current system. Unfortunately, that is not true. Giving the General Assembly more power over redistricting is a bad idea at any time. Doing so now, when the current members of the General Assembly are the product of districts that were drawn on a partisan basis, is unconscionable. We need a clear break from partisan redistricting, and that can only happen if we create a truly independent commission rather than one whose initial product will be controlled by a General Assembly elected under current district lines. The citizens of Pennsylvania deserve a truly independent redistricting commission. The Folmer plan is a classic bait and switch, promising such a commission but not delivering on that promise. It is critical that every citizen of Pennsylvania who wants fair districts speak up now and demand that the Senate reject the Folmer version of SB22 now and tell the committee to come back with a sound plan for an independent redistricting commission. And should the Folmer plan pass the Senate, we must insist that the House reject it.